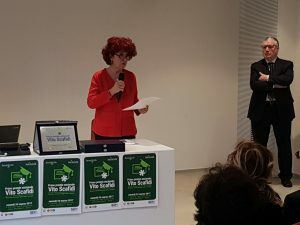 The Minister of Education, University and Research visits CNR attends the award ceremony of the “Vito Scafidi” degree prizes for the safety of school buildings, organized by ITC-CNR. On March 24, the Minister of Education, University and Research, Honourable Valeria Fedeli, visited the headquarters of CNR, welcomed by the President, Prof. Massimo Inguscio, to attend the graduation ceremony dedicated to the memory of Vito Scafidi, the student who died during school hours in Rivoli (Turin) in 2008 because of the collapse of a suspended ceiling. 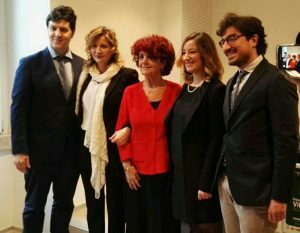 The national prize “Vito Scafidi” was established on the initiative of the family of the unfortunate student with the support of the ‘Welcome to Italy’ foundation to raise awareness about the structural safety of school buildings. With the patronage of CNR and the appreciation of the President of the Republic, the award ceremony, organized by the CNR Construction Technologies Institute, was held at the multifunctional hall of the headquarters of CNR, before a number of national authorities in representation of universities, research bodies and governmental organizations involved in the construction sector. The prize was jointly awarded to three students, whose degree theses were characterized by a rigorous methodology and innovative contents relating to the safety of school buildings, with particular attention to both structural and non-structural components (such as those that led to the tragedy that occurred to Vito Scafidi). In their speeches, the numerous representatives of the Superior Council of Public Works, of the Academy, of the Research community and of the world of politics, addressed the issues and uncertainties encountered while assessing the safety of the existing school building heritage. A special attention was drawn to the activities that CNR has been carrying out on non-structural components for many years. The reason behind this relentless activity is related to the many accidents that have occurred in Italian schools and in other premises in recent years. Focus was also set to the developments in research that have involved industry experts in recent years that are leading to the publication of a special CNR technical paper. Thanks to the presence of the leading representatives of the Superior Council of Public Works, a state-of-the-art review was carried out on the guidelines for detecting vulnerability of non-structural elements in schools. In this context, the Minister, the President of CNR and the representatives of the attending institutions repeatedly reaffirmed the strategic role of the Italian schools, which they defined as “houses of culture” and the “future” of our children. The premature death of Vito Scafidi was the stimulus for a strong scientific, technical and regulatory activity aimed at improving the safety of school buildings, in an attempt to bring a sense of hope to the sad end of the young student from Piedmont.